Join the discussion on our forums! 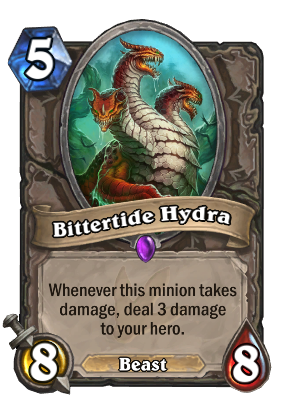 Come discuss Bittertide Hydra over in our dedicated Bittertide Hydra discussion topic. Whenever this minion takes damage, deal 3 damage to your hero. It's actually only the middle head that's bitter. The others are sweet and spicy. Best zombeast combination, Bittertide Hydra and Vicious Scalehide. Better than 4 mana 7/7 (because you can smartly play around its downside). Best 5-drop in every mid-range deck. - I play The Coin + Innervate -> Bittertide Hydra. - Shaman freezes it with Frost Shock. - Shaman gets a Healing Totem from Totemic Call. - I buff my Hydra with Mark of the Wild (10/9) and attack his face. - Shaman plays Lotus Illusionist. - My hydra and his totem soak up enough damage that his Illusionist survives. - Shaman attacks my face directly (27 + 3). Huge tempo gain if played on turn 4 or 5 (and game-winning alone if played on turn 1 or 2 by druid). Great addition to my face Hunter deck. Only gets actually rekt by volcano, but Hunters always get screwed by Shaman anyways. Funny how people are saying this card is bad? Turns out its pretty strong. The epic version of Millhouse Manastorm. I see a lot of comments like Volcano destroys this, but when it is played turn 1, by a druid you will never get to turn 5 to even play it. 4x8 is 32. GG, and that is if he doesn't Mark of Y'Shaarj it and kill you earlier than turn 4.
you have any idea how beyond unlikely that is? Dropping this in the current meta is a good way to automatically take 12-15 damage when your opponent takes their next turn. Meanwhile, you have a Gadgetzan Auctioneer in your hand, one of the most degenerate interactions in the game. You types seem to complain about the game being bad when its not in your favor. Thought this guy was the 5-drop to slam in aggrodecks (druid, warrior, hunter). Haven't seen much of him on ladder, destpite these decks being fairly popular. Haven't seen him aside from one tournament either. Is he even that good? Great in some matchups, terrible in others. It's typically a dead card against decks like Token Shaman/Druid, because they can just plow a bunch of 1-mana minions into it, kill it, and deal like half your health in the process. A new staple for aggro decks which usually you dont care about your face health. 1 is very good for every deck, 2 could be a little bit too dangerous. Saw this dude dropped on my whilst playing a Pirate deck (death threats on a post card please) and took an educated gamble. Ran all four of my minions into and then face tanked it to chip 15 off my opponent. Guess he thought I'd just go face. I thought this was gonna be the new Fel Reaver, but it turns out you can be dealt 15 damage pretty easy, at least against Rogue.